This text formed the basis of a talk given at the Bradford Literature Festival in May 2015. As we reach the 70th Anniversary since its first staging in Russia in 1945, we ask what is the enduring appeal of An Inspector Calls? What makes it Priestley’s most performed and most popular play? Pinpointing one single reason is difficult so let us consider three. Reason one is that there is nothing difficult about the play. It is not expressionistic or experimental, nor is it abstract or symbolic – like Music at Night or Johnson Over Jordan. It is a straightforward three-act play where the action is continuous and the pace brisk. Priestley’s language is also not difficult. His dialogue is composed of what he himself called ‘that familiar flat idiom’. Now this facility is not because Priestley couldn’t write complex plays with symbolic meanings conveyed in abstract terms using language that is hard to understand; it is because on the whole he chose not to. He deliberately chose a wide channel of communication and wanted to reach the widest audience possible. Simplicity to Priestley was a virtue. He once wrote that he ‘wanted to write something that at a pinch could be read aloud in a bar parlour. And the time soon came when I was read and understood in a 1000 bar parlours’. An Inspector Calls has been heard and understood in thousands of theatres around the world. Its simplicity is therefore a large factor in its enduring appeal. The second reason is that it is a gripping piece of drama that maintains the shape and atmosphere of a thriller. It is a play that demands answers to questions that can only be found by continued watching. As soon as the Inspector walks into that drawing room we are hooked. Who is this girl Eva Smith? Why did she kill herself? Did each member of this family really have a hand in her demise? What did they do? Why did they do it? Who is this Inspector? Is he a real Inspector or someone or something else? And then of course at the very end the telephone rings bringing more questions and questions about questions. The Inspector moves among the Birlings and Gerald Croft like a moral whirlwind, ruthlessly exposing each of them in turn. It is tremendous to experience it in the theatre. Merciless in his pursuit of the truth Goole brings each to account for their social crimes. His exchanges with Birling are an almighty collision between two entirely opposite creeds. We want to know who will win. Even when we know he will our own need see it played out keeps us watching. Their exchanges present some of the most powerful lines in the play, few more so than when the Inspector says to Birling ‘it’s better to ask for the earth than to take it’. This duel between the two men is magnificent theatre. The final reason is the central, simple question the play asks us: who is responsible? It can be argued that Priestley more directly answers the question Dickens posed a hundred years before. We need only substiture Eva Smith for Joe the sweeper. And he goes further than than posing it – he warns us, realistically, the disaster that continued irresponsibility will bring. Events in the twentieth century show this to be true. As long as that question needs asking and as long as it requires an answer this play will endure. The following text, by Dr John Baxendale, is a programme essay for a production Of An Inspector Calls at the Canadian Shaw Festival, 2008. An Inspector Calls is about the death of a young woman. But it is not a whodunnit – at least, not of the conventional, forensic kind. An inspector arrives to investigate the death, but the questions he asks the well-heeled, complacent Birlings are not those of your typical policeman. In any case, the death is a suicide: there is no killer to be unmasked. Instead, a different kind of culpability is being investigated, as we, and the Birlings, are led through a series of revelations which pass the moral blame for the girl’s death from one family member to another – and, ultimately, to a whole social system and set of values. Priestley wrote An Inspector Calls at top speed during the last winter of the Second World War, 1944-5. Victory was now inevitable, but the climactic events of 1945 – the death of Hitler, the A-bomb, Labour’s landslide election victory – were still in the future. At that moment, Priestley was one of Britain’s best-known and most admired public figures. He had already become famous in the 1930s as a best-selling and hugely prolific novelist, playwright and journalist, but the war turned him into something more. His BBC radio broadcasts, starting in the epoch-making days of June 1940 and continuing through the Blitz, made him a popular propagandist second only to Churchill (and incidentally a regular broadcaster to North America); but there was more to them than mere morale-boosting. As Graham Greene (who disliked Priestley’s writing) said, ‘he gave us an ideology’. Where Churchill invoked a thousand years of history, Priestley spoke of the future, of how life should be after the war. For him, this was a ‘People’s War’, in which survival depended on the spirit and commitment of the ordinary people, who, if they seized the opportunity, could at last enter into their long-denied inheritance. We were not fighting for a return to the status quo – that was gone for ever – but for a new kind of society – as he put it, ‘a nobler world in which ordinary, decent folk can not only find justice and security but also beauty and delight’, a world in which we could stop thinking in terms of property and start thinking of the nation as a community. The war was making people realise, Priestley told his listeners, that we were all in the same boat – and it was a boat which could land us in a better world after the war was over. This visionary radicalism inevitably got him into trouble with more conservative elements, including Churchill, who felt that talk of postwar reconstruction was premature and raised unrealistic expectations – and, no doubt, that things were better left to those in charge. Priestley, undaunted, was led into one of his occasional bouts of political activism, as chairman of the newly formed and rather ad hoc Common Wealth Party, which was to win several wartime by-election victories against Conservative candidates. We can see all this as part of the radical political mood of wartime, much debated amongst historians, out of which the reforming Labour government of 1945-51 was to emerge – at least, according to some accounts. But for Priestley, who campaigned for Labour in 1945 and 1950, these ideas went deeper than the fashionable collectivism of the moment. He had grown up in Bradford in the politically turbulent Edwardian years, and his attitudes and beliefs were shaped by the socialist culture of that city, and of his schoolmaster father. When in 1930 he finally became successful with his runaway best-seller The Good Companions, the world slump was under way, and Priestley used the freedom which his fame and fortune gave him to turn his hand to social criticism, in popular journalism, in novels like Wonder Hero, and in English Journey (1934), his masterful and still woefully underrated dissection of the conflicts and contradictions of 1930s Britain. An Inspector Calls is undeniably a product and expression of the radical moment of 1945, but it also has roots much deeper in Priestley’s life and ideas. Brumley, where the play is set, is an industrial town much like Bradford, its self-satisfied business elite much like those satirised in Priestley’s ‘Yorkshire farcical comedy’ When We Are Married (1938), and excoriated in English Journey for abandoning the communities which made them rich, and making their workers live ‘like black-beetles at the back of a disused kitchen stove’. Arthur Birling, according to the stage directions ‘rather provincial in his speech’, has the air of an upwardly-mobile self-made man. His wife, we are told, is his social superior; his daughter is about to marry the scion of a wealthier business family; there may even be a knighthood in the offing. All this is the product of a philosophy which holds that ‘a man has to make his own way’, keeping his business costs down and his workers firmly in their place – and not listening to those cranks, of whom the Inspector turns out to be one, who thinks ‘everybody has to look after everybody else’, and bangs on about ‘community and all that nonsense’. When, in the climactic speech of the play, the Inspector warns the Birlings that ‘We don’t live alone. We are members of one body. We are responsible for each other’, he is echoing Priestley’s wartime message, and his hopes for the postwar world. But he also speaks for the whole English radical and socialist tradition of which Priestley was a part, and its rejection of Birling’s laissez-faire individualism. It was this tradition that seemed to make the political running during wartime, when collectivism was not just an ideal but a necessity, and which came to power in the 1945 election, when Labour won a landslide victory and formed its first majority government. That government went on to found the National Health Service, nationalise key industries, and institute the managed economy based on full employment, all of which remained in place for the next three decades, until Margaret Thatcher tried to roll them back in the 1980s. 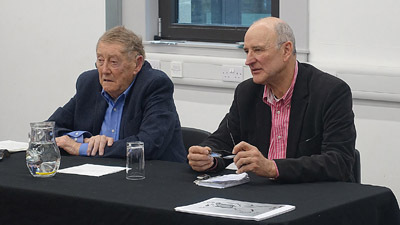 Not surprisingly, when the play was revived at Britain’s National Theatre in 1992, the production was hailed as an explicit critique of the prevailing Thatcherite – or should we say Birlingite – values. But if An Inspector Calls is ‘really’ about 1945, why is it set in 1912? The Edwardian years had a particular fascination for Priestley. They were the years of his Bradford youth, a lost arcadia when he was working in a wool merchants’ office and trying to become a writer, before enlisting in 1914, aged 20, at the start of the Great War, after which nothing was ever the same again. For Priestley, these were years of missed opportunity: there was a fork in history’s path, and the wrong direction was taken. In the ferment of Edwardian ideas – reflected in Birling’s contemptuous dismissal of the ‘cranks’, Bernard Shaw and H G Wells – a more democratic England had seemed to be in the offing, but the hope was lost in the mud and blood of Flanders and the monstrous betrayal of the survivors after the war ended. These were years which Priestley revisited repeatedly in his novels and plays, as well as in his remarkable memoir Margin Released (1962). Perhaps, ever preoccupied with time, as we know from plays like Dangerous Corner and I Have Been Here Before, he wanted to rewind history to the point where things could have turned out differently. Arthur Birling is a man of that time. He believes in progress, which has put him where he is; he believes in the technological future: aeroplanes, motor-cars, even (a little obviously, perhaps) the Titanic, that great enduring metaphor which is just about to make its first and last voyage; and he believes that progress has made war impossible. So that when the Inspector, shamelessly invoking the hindsight of the audience, threatens ‘fire, blood and anguish’ if people in 1912 will not learn the lesson that we are responsible for each other, we know something the Birlings don’t, and we may well wonder what history has in store for the two young men in the cast. This is dramatic irony on a historic scale: unlike the Birlings, 1945 audiences are being told, you’ve had two doses of ‘fire, blood and anguish’: have you learned the lesson yet? And this, remember, was written before Hiroshima. 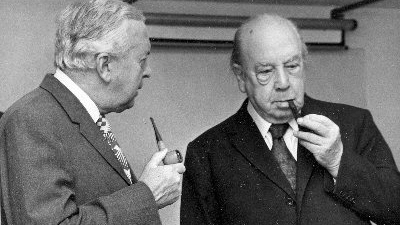 An Inspector Calls is the work of Priestley the socialist, but even more so of Priestley the visionary. Priestley’s socialism was never of what he called the ‘agenda-programme’ kind: he came to think that Labour had lost its way after 1945 in the minutiae of legislation and reform and committee-work, and failed to keep alive the shared vision and creative gusto of wartime. The play is not about social reform, better health care or full employment, important though these things are, but about a vision of how life could be different if we acknowledge the truth that we are all members of one another. Later in 1945, Priestley recalled for his radio audience the summer of 1940, when ‘we had a glimpse of what life might be if men and women freely dedicated themselves, not to their appetites and prejudices, but to some great communal task’, and amidst the brute threat of war there appeared on the horizon ‘the faint radiance of some far-off promised land’. Everyone must find their own interpretation of the play’s enigmatic ending, but Priestley may be telling us that second chances do come, even out of the most unpromising circumstances; and if the vision was lost in 1914, and even in 1945, all may not be lost forever. Let us hope he is right. 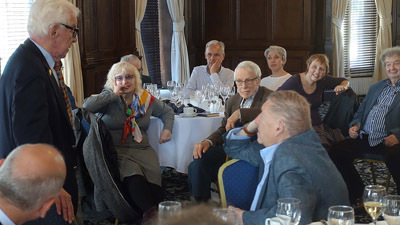 John Baxendale is a former Principal Lecturer in Cultural History at Sheffield Hallam University, and the author of Priestley’s England: J B Priestley and English Culture (2007).